Quite pleasant audio. Plays mp3 encoded discs. Right speaker weak, though audio circuit through earphones shows perfect balance. No ability to adjust balance between left and right speakers. 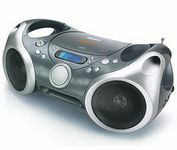 Audio not as good as comparable Coby boombox.